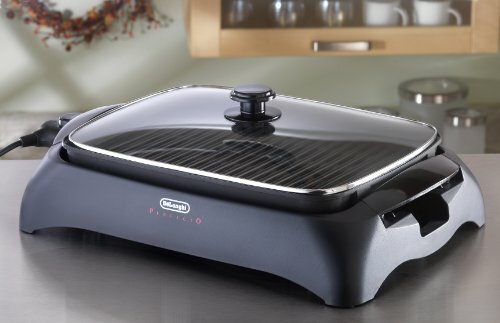 Best Smokeless Indoor Grills For All-Season Anywhere Grilling . Which one is our #1 pick? Our favorite is the Hamilton Beach 25360. It's a trusted brand, it sells for a reasonable price, and it's got over 1,000 positive reviews on Amazon. The Philips smokeless grill is powered by superior infrared technology that will heat the grid so that your food is cooked evenly for a delicious taste. Like many indoor grills, this appliance has several temperature settings, instead of giving you full control over the heat. On the highest setting, this grill can reach 446-degrees Fahrenheit. Below the grill is a drip tray, allowing grease to fall from the meats. The drip tray remains cool, which helps prevent the release of steam and smoke, though you may still notice a small amount of smoke. Allowing the grease to drip from the food provides and added benefit – it helps reduce the overall fat content of your cooked meats. Clean up is quick. After the grill grate cools, you can simply wipe it down or place it in the dishwasher. This should take no longer than a minute. 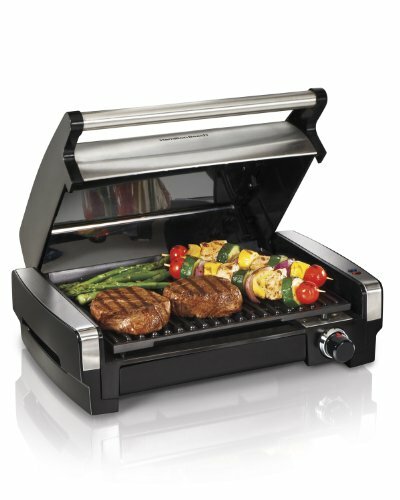 Overall, this grill reaches the top spot for the infrared technology and unique design that cuts down on smoke and fat! The Delonghi BG24 Perfecto indoor grill features a controllable thermostat and glass lid that is used to keep all the heat in one place. The nonstick grill plate and removable drip tray will be easy to clean whether you hand wash or use a dishwasher. After emptying the tray and wiping down the cooking surface, you can be prepared to start cooking for the next day. The lid is a nice addition, as it can be used to keep your food warm. Simply leave the lid on after turning the grill off to keep extra food from cooling. 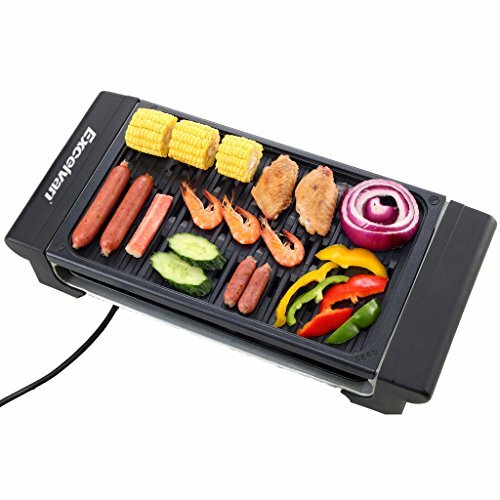 It also provides even heat across the grill grate to fully cook your meats. The adjustable thermostat will also ensure that your food doesn’t burn while being on the grill; causing unwarranted smoke. Some people have mentioned that it takes a while to heat and that its not very durable. This is countered by the low price, which makes it a great buy. The Hamilton Beach indoor searing grill will fit any size kitchen. If you want to have full control over how hot the grill becomes, you can use the adjustable temperature knob on the right of the drip tray. This will allow you to find the “perfect” temperature for whatever you’re cooking. The temperature control can also help cut down on smoke. If the grills gets too hot, smoke will arise. The lid will keep some of the smoke in place, so if you notice the lid filling with smoke you can simply lower the heat. One of the more helpful features of the Hamilton Beach indoor searing grill is the indicator lights on the side. These lights will signal when the grill is heating up and when it’s finally ready. One of the more intriguing parts of this grill is the removable lid. The lid can be detached from the unit and placed into the dishwasher after use. The Excelvan is not a well-known brand, but they make a great grill. This smokeless electric grill has plenty to offer and comes in two sizes. Choose from a 20 x 9 x 4-inch or 20 x 10 x 4-inch version. On the side of this smokeless electric grill is a temperature control knob. Depending on what type of food you are cooking on the grill, you will likely find a comfortable temperature right in the middle. 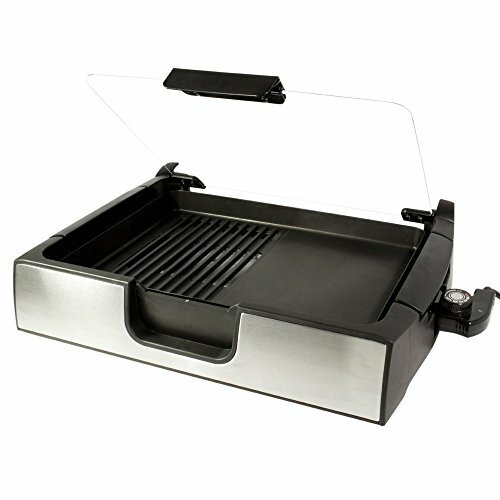 Like most electric grills, this unit has a nonstick drip tray that is meant to collect the grease drippings coming from the food. Some buyers have stated that they have been having issues with the tray staying in place; causing a mess on their counter. Excelvan has suggested that users put a little bit of water in the tray to avoid cooking fumes from oil and unnecessary peeling. The Smart Planet SIG-4 stainless steel grill is another unit that goes completely under the radar when it comes to smokeless indoor grills. This grill does a great job at keeping the heat in one place while ensuring that the meats retain all their natural juices. You get two cooking options – grill and griddle. The grills gives off about 1500-watts and temperatures up to 450-degrees Fahrenheit. The adjustable temperature control knob offers several different heat settings. Cleaning the grill is easy. It breaks down into 4 separate parts, so you can clean every edge of the grill. This prevents smoke, as it makes it easier to get rid of leftover grease and food particles. If you’re the type of person that likes their food juicy and tender, you’re most likely going to want a grill that has a lid. Smokeless indoor grills such as the Hamilton Beach indoor grill, the Smart Planet SIG-4, and the Delonghi BG24 are reliable options for you. The latter two have glass lids, while the Hamilton Beach grill has a stainless steel lid. If you're on a budget, the Excelvan portable grill or the Smart Planet SIG-4 are good options. These grills are priced reasonably without sacrificing quality. Both units have everything you would want in a smokeless grill, such as easy to use temperature controls. 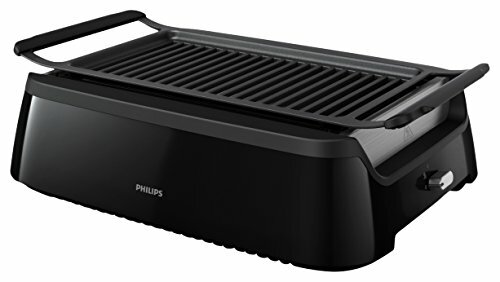 While most electric grills will take some time to heat up, and more often than not, fail to reach high temperatures that charcoal and gas grills would hit with ease, the Philips smokeless infrared grill gets the job done. The grill will almost instantly reach roughly 446-degrees Fahrenheit; making sure your food is cooked thoroughly and evenly. Along with these smokeless indoor grills, you may have a few other options for cooking at home. For example, you could choose a grill for your apartment balcony or consider getting a grill that will fit in small spaces. Smokeless indoor grills are meant to keep you from inhaling smoke throughout the entirety of your cooking session. They also help keep smoke alarms from getting triggered and provide the added benefit of reducing fat. Most of these grills feature a drip tray, which catches the grease from your cooked foods. These grills also tend to be small. When you're cooking a smaller batch of food, you're going to produce less heat and smoke. They are also designed to be easy to clean. This is to make it easier to remove leftover food particles and grease. When these particles burn, they release smoke. You may also notice that some of these grills come with lids. The lids can trap the heat and humidity, which keeps your meat from drying out. The lid isn't always necessary to prevent smoke, but it can improve the flavor of your foods. Another thing you’ll notice about smokeless indoor grills is that most of them use electric as a power source. This is once again for health reasons, as charcoal and gas can release carbon monoxide fumes. With electric grills, there isn’t an open flame, so there is virtually no chance of flare ups; events that would most definitely cause high amounts of smoke to arise. If you feel that an electric grill lacks the char-taste associated with grilling, you can use a substance called “liquid smoke”. This is added directly to your food before grilling and can recreate hickory, applewood, and mesquite flavors. This substance was made through the condensation of smoke and can be applied to any type of meat you’re cooking. If you can’t find liquid smoke, there are a few seasonings that may help, including sea salt or paprika. At the end of the day, grilling consists of hot dogs, burgers, ribs, and steaks searing on the cooking platform. Just because you’re cooking inside doesn’t mean you have to take away the benefits of grilling food. With smokeless indoor grills, you’ll be able to cook your favorite foods without being hindered by dreadful smoke that sometimes comes from the grill.